what is the deal with Hulu? One of the best things about hanging on to that TV cord? Flipping through the channels with the knowledge that at some point, likely very soon, you’ll land on an episode of Seinfeld. 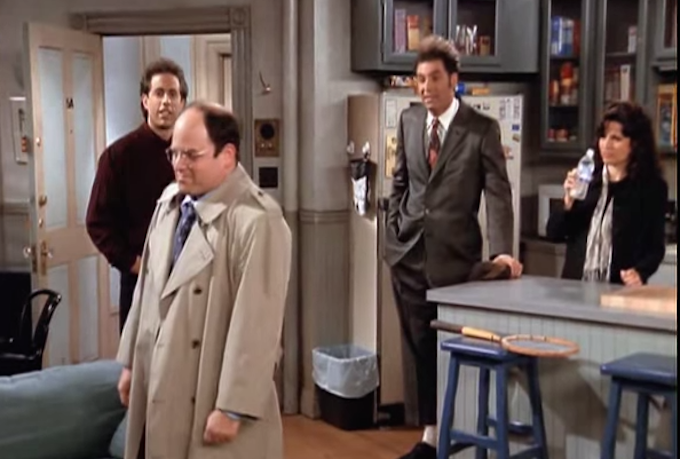 Cord-cutters can get in on that feeling now as well, as a report says Hulu has signed a deal to snag reruns of Seinfeld. The Wall Street Journal cites people familiar with the matter who said the new deal will be announced to advertisers today at a presentation in New York, in what is one of the biggest programming buys in Hulu’s history. Terms of the deal weren’t disclosed, but the insider talking to WSJ said each episode of Jerry and the gang was valued at about $700,000. That would make the whole shebang worth close to $126 million for all 180 episodes, going by that figure. Other reports have quoted a price near $1 million per episode. Hulu wasn’t alone at the bidding table — Amazon.com and Yahoo also reportedly threw their hats in the ring, but ultimately failed. Netflix had been interested at first, it’s reported, but then walked away to grab streaming rights to Friends instead, at about $500,000 per episode. Never fear, those with the remote in trembling hand — TBS will still be airing reruns of Seinfeld on regular TV, waiting for that moment when you flip through and decide to land on 1990s New York, yet again.